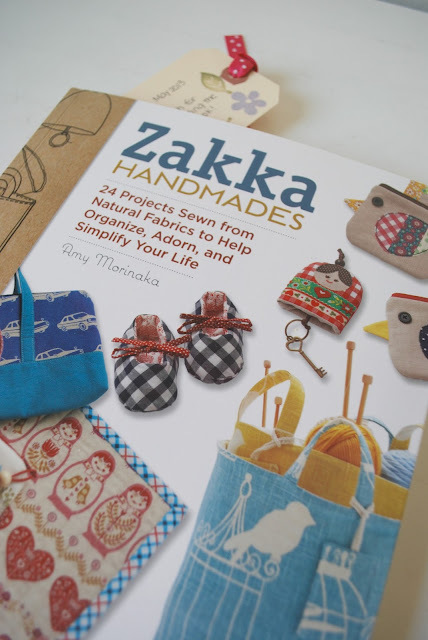 to join the Zakka Handmades blog tour. as well as more advanced sewers. but I decided to start with a rice therapy eye pilow. - not because I don't like it! ....I was a lazy sewer that day, that's it. If you like Zakka too, you have to buy this book! ...but you have a chance to win a copy of Amy's book. by Friday July 19th. The giveaway is open internationally. I will announce the randon winner on July 20th. in the blog tour. There's a giveaway at every stop! The book looks great with many cute and fun pattern. Love to give a try. Thank you for the chance to win! I love it!!!! Count me in. I can't wait to get this book! It looks like so much fun! I would love to win that book - thanks for the chance. Thank you for the giveaway of this awesome book. I love these projects. Just bought Stitch Zakka and love it! Very cute eye pillow. I make those sometimes with rice, but a little less quilty. They are very nice for when you need a hot compress. 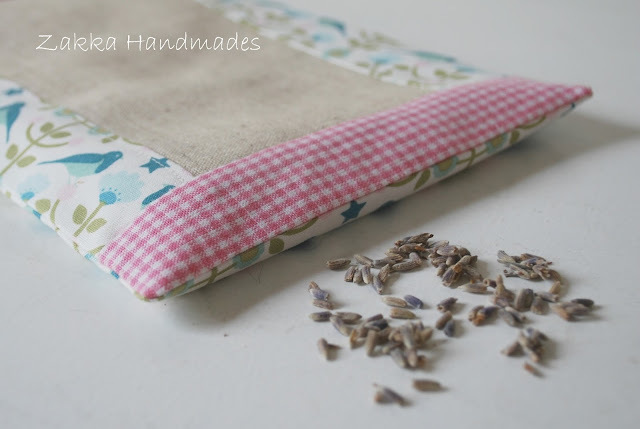 I love your little eye pillow, what a great idea for sore tired eyes. 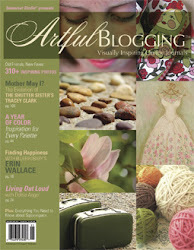 The book looks fabulous, I have only just found your blog and would love the chance to win. Cute ideas, I would love to win this book for my daughter who loves everything japanese. I love your eye pillow, and the bird fabric you used is adorable! Where did you get it? Thanks for a chance to win this book. I'd love to win this book! Thanks for the giveaway! 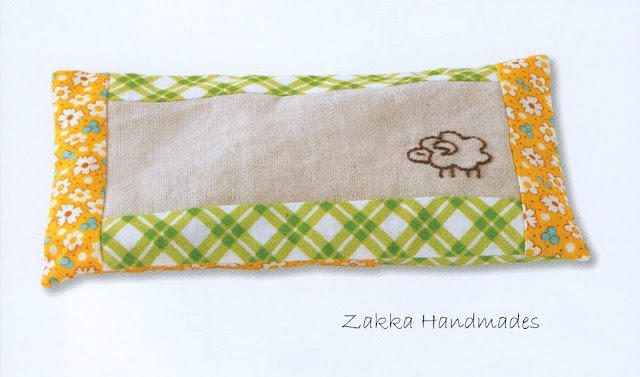 I've seen so many cute Zakka things -- I really must try some! This book looks awesome. I would love the chance to win it. Thanks for the chance to win it. I am so excited to see this book in person - loving all the sneak peeks! Hvor er den fin. Det er lidt sjovt for jeg har netop gået og tænkt at jeg vil sy sådan en pude, med hørfrø og lavendel. Vi bruger dem til yoga og jeg elsker når afslappelsen finder vej til kroppen og man kan dufte lavendlerne i puden. So sweetly zakka. Love the rice pillow. Thanks for the giveaway. So much fun to see all the great projects from the book! Your eye pillow is adorable! The sheep looks so sweet! Man kan jo altid håbe. This book has so many fun projects,but my favorite is the "fabric bucket". I hope luck is on my side! I agree with many of the comments, I would add the lavender since I have so many plants. Such a cute projects. This looks like a wonderful book. It would be so much fun to win a copy! I love your project - it is simple and lovely!! This book has so many things that I would make for gifts... Thanks for the chance!!! The rice bags would be so useful. Every time I see those baby booties/shoes, I know I'd love to make those. They are adorable! All your projects are so sweet and unique. Thanks for giveaway! What a good idea. I love the fabrics you used. So cute. What a lovely rice pillow! 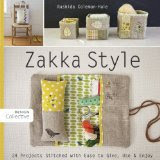 I'm just learning more about Zakka and I'm loving it. So many cute items! I'd love to make the cute items in the book. Thank you and Amy for a super giveaway and a chance to win. I love all your sweet things and of course this giveaway! I like your version of the eye pillow--cute! New to your blog and enjoying it! I'd love to win this book, it looks awesome. 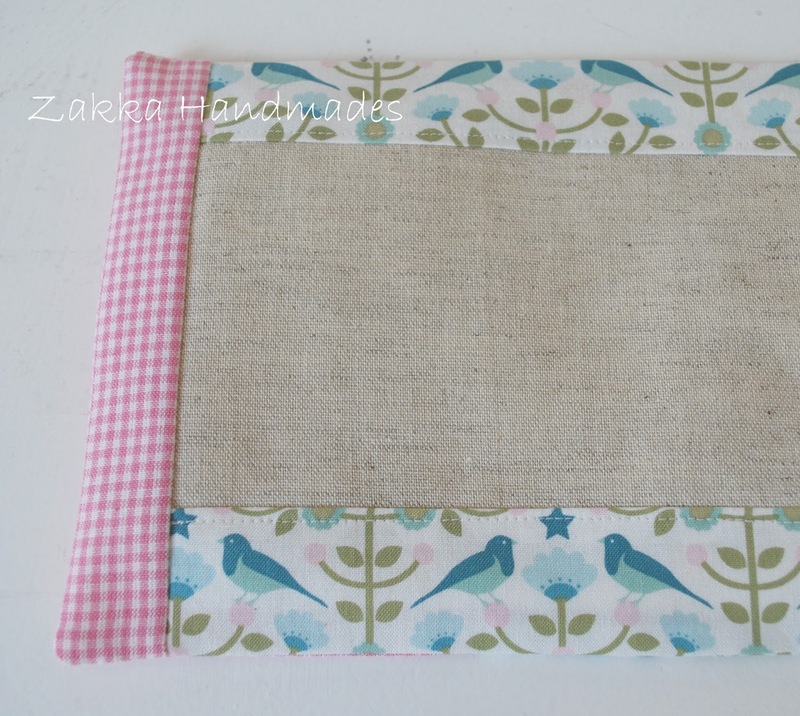 I love this project and your version with some Tilda fabric. Looks really good together with the linen. I have enjoyed seeing these projects online! Looks like a great book! I'd love to win this book,I can see beautiful projects !! I love your little pillow. Thanks so much for sharing it and your thoughts about this book. This is an awesome book - thanks for the give away! The book is so inspiring. I'd love to make those little baby shoes. Thanks for the chance to win a copy. I'd love to have a copy of this book to add to my library. There seem to be so many fun projects. This book sounds really inspiring! So many fabulous projects - this looks a great book! I love the mix of beautiful fabrics, and would so love to a have a copy of this book. Many thanks. This eye pillow idea is neat. I have made one with flax seeds. The only problem is it's easy to have it fall off (and for me lands under the bed). Once my husband lost his under the bed which is right next to the sliding glass door, and it sprouted due to the moisture from the window! I like the idea of using rice. It seems safer! Yes, a pillow of lavender buds would be such a nice gift for someone or just for me! What a great project. I like lavender. I am like you a big zakka fan. So this book would be the perfect addition to my craft book library. Thank you for the lovely giveaway. I have been following this blog tour and have not seen one project that I don't love! Thank so much for reminding me that the projects can be made without the hand embroidery and still look beautiful. I would love to win, there are some nice projects in there. Love the book! Hope to win. I would like to win. I think I would like to make it all! The book looks great. Thanks for the chance to win! I love the projects from this book that I've seen so far, and your version is very lovely. I think it's great that they work with, or without embroidery! This book looks amazing. Thanks for the chance to win it. Great fabric choices. Thanks for the chance to win! What a great project and awesome book! Hope to win! Thanks for doing a giveaway! Oh boy would I like a copy of this book! Thank you for the opportunity and all of your inspiring works! 50+ mother, wife, daughter, sister, friend. I like to craft, bake, read and travel and I do my best to enjoy life to the fullest.